Nestled within the Evergreen Brickworks, Café Belong benefits from its proximity to the year round farmer’s market. Perhaps perusing the fresh food stalls beforehand influenced my meal choice, but their vegetarian dishes sounded fantastic and I didn’t miss an ounce of meat! Replacing ham, the sautéed kale and mushrooms eggs benedict ($23) incorporated plump mushrooms that provided a meaty bite. 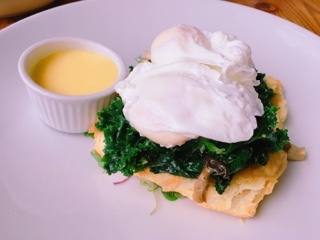 As the poached egg oozed over everything, the molten yolk was captured into the not overly done kale’s crevices, making for a cleaner dish. A layer of sweet caramelized onions sat on top of the doughy soft buttermilk biscuit; it was a bit sugary for my taste, but thankfully the buttery hollandaise helped to add back a savoury element. Although the frittata ($19) is listed under the “cold kitchen” section of the menu, it still arrives warm. 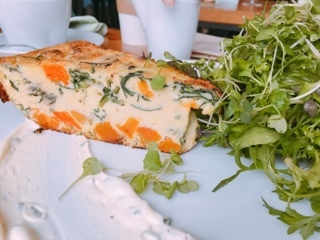 The cubes of roasted butternut squash at the bottom makes the egg dish heartier and I rather enjoyed the grilled red onion and wilted spinach that adds a bite and colourful contrast to the frittata. Just make sure to smear on some of the creamy goat cheese (?) purée from the plate, the tangy saltiness makes for a great addition. A perfect “dessert” for sharing is their fluffy pancakes ($20 for three). It starts with the requisite eggy and buttery batter and is topped with ricotta, granola and stewed apples. Personally, I found the crunchy granola clusters detracted from the pillowy soft pancakes, but it did pair nicely with the large soft cinnamon apple chunks. 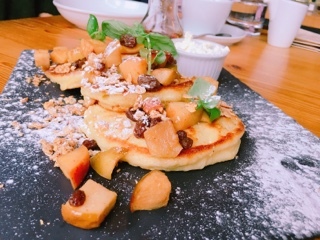 The toppings aren’t overly sweet, so you’ll want to pay the extra $4 for warmed maple syrup – pancakes aren’t the same without this wonderful nectar. 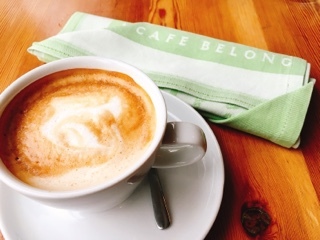 If you’re like me and tend to opt for meaty options during brunch, I encourage you to head to Café Belong and give our plant-based friends a try. After all, maybe Meatless Mondays could easily become Botanical Brunch Saturdays?